Lian-Li has been a staple in the PC industry for a number of years now, producing a number of well built and equally well designed aluminum PC cases. 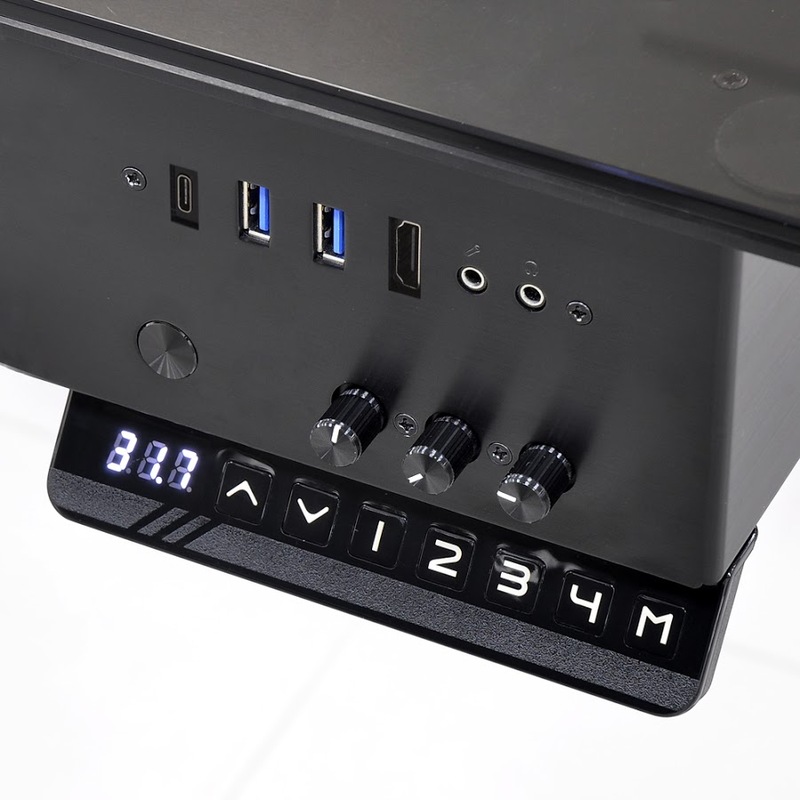 They have come out with chassis to hold SFF Mini-ITX up to E-ATX based systems, all the way to full-size desks. 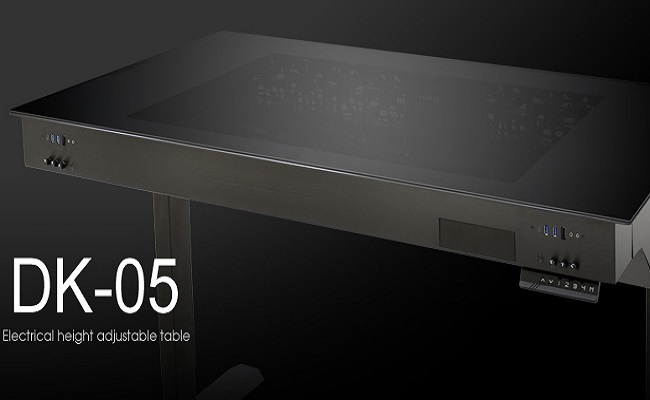 However, the company isn't just in the traditional chassis business, and a few years ago they branched out with the release of their unique DK-Q2, their first computer desk which housed full sized components underneath a layer of tempered glass. Since then they have released the DK-03, last year’s first motorized, height adjustable enclosed DK-04, and now they are taking the wraps off of the latest version of their PC desk design: the DK-05. The DK-05 was first shown in Lian-Li’s booth at CES earlier this year. Lian-Li says they have added more cooling and more flexibility in the latest iteration of their motorized adjustable PC desk. The jet black aluminum DK-05 is able to support two complete workstations under the tinted tempered glass surface, capable of fitting up to E-ATX sized motherboards. By comparison, the outgoing DK-04 was only able to accommodate one system. Consequently, the overall size of the DK-05 has grown a bit to 140cm(55.1”) wide x 689mm(27/1”) tall (minimum) x 780mm(30.7”) deep in order to have enough room to house two systems comfortably. 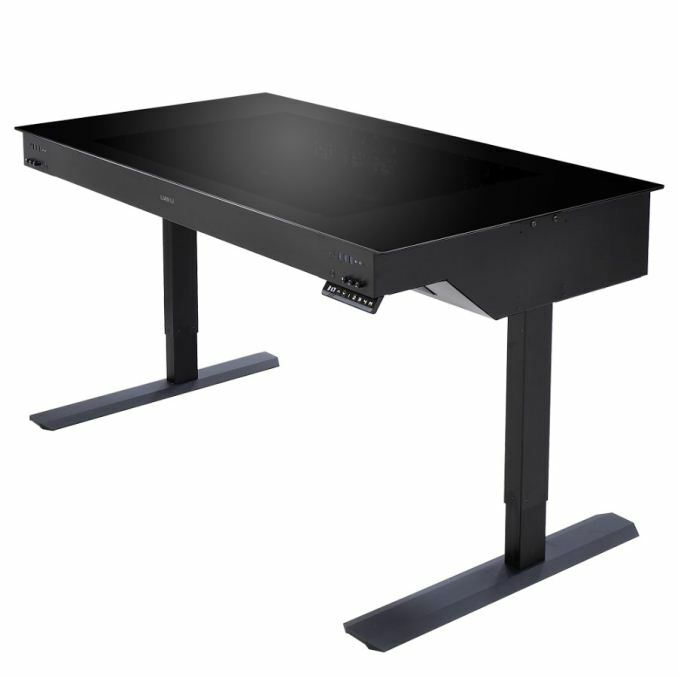 These dimensions allow for plenty of workspace on top for multiple monitors, keyboards/mice, and other accessories. Since it now has the ability to hold two systems, the number of fan locations increased from 8 in the DK-04 to 12 for the DK-05 (6x front, 6x rear – all 120mm w/ 12 fans included). This was likely necessary in order to remove the heat created by two complete PCs inside the tempered glass top. Designed for liquid cooling, the DK-05 can hold one 480mm radiator (left side rear), and 3 360mm radiators in various locations. Between the motherboard trays are mountings for pumps, reservoirs, or additional drive storage. Each side has a removable motherboard tray where owners mount their systems, including ATX power supplies up to 280mm in length, graphics cards up to 360mm in length, while the headroom for CPU coolers maxes out at 160mm high. There are two independent front panels connecting to each system, with one on the left and one on the right. Both are mirror images of each other, containing 2x USB 3.0, 1x USB 3.1 Type-C, 1x HDMI, HD Audio, power button (no reset buttons? ), and dials for adjusting RGB LEDs. Lian-Li considers the desk VR ready, as there is are HDMI outputs on both front panels to connect your VR headset of choice. The right side of the desk below the front panel is where users will find buttons to control desk height. A digital display shows the current height (in CM) and to the right of it are the control surfaces for adjustment. There are two up and down arrows for manual height control, as well as having four user-programmable presets. 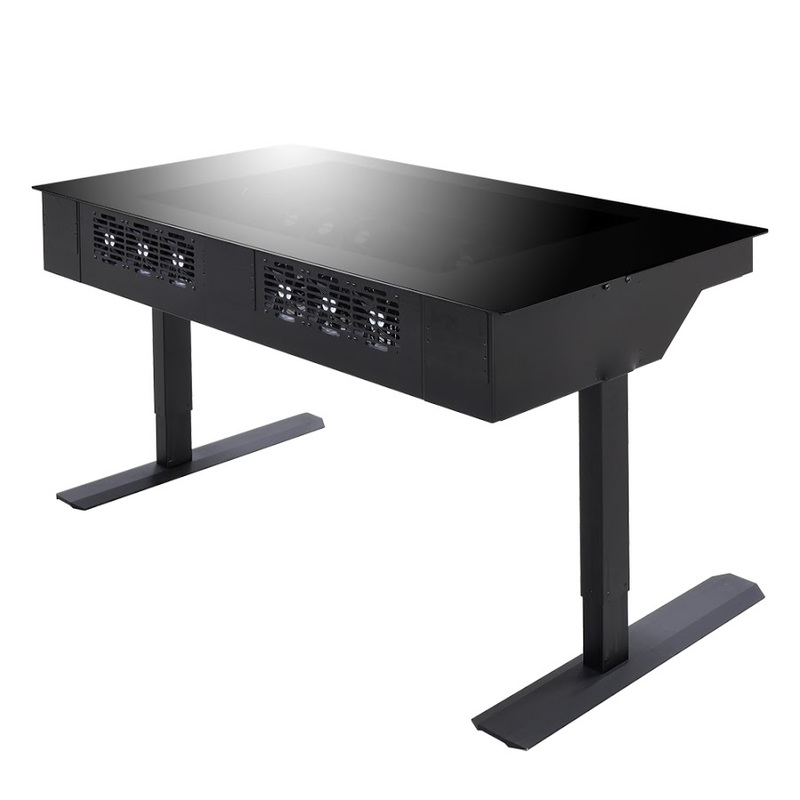 The desk has enough range to accomodate both sitting and standing configurations, with a minimum height of 68.9cm(27.1”) to maximum height of 117.5cm(46.3”). The Lian-Li DK-05 is available now at an MSRP of $2099.99. I know quite a few folks that still use desktops, but I'm a software developer, so I might be running with a different crowd. I also have a HTPC as my main entertainment device and "game console", so I'm in a dwindling minority of users. I think you're talking about a different I/O panel. The front I/O is fine. It's the "rear" I/O with all the graphics card connections, network ports, and the majority of the USB HomeworldFound is talking about.